One of the main differences between a quality saw and a poor quality saw is the hardness of the steel. An economy saw is relatively soft and will not hold a cutting edge as long as a quality saw. In the day, manufactures went to great effort to make saws that would hold an edge as long as possible but could still be filed, set and swaged without any problems. Most vintage saws met that goal. I was curious to see how saw steel would respond to normal tool steel heat treating operations so I jury rigged a Brinell hardness tester and did some testing. 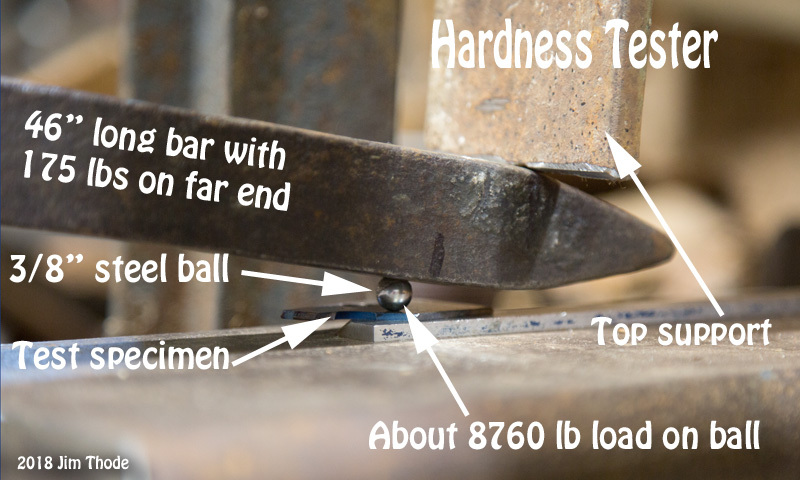 If the load on a hard ball, the diameter of the ball and the diameter of the dimple in the sample is known, the Brinell hardness number can be calculated. See the photo for details of my tester. I started with a section of crosscut saw and changed the hardness from the original condition to softer, to softer yet, to very hard and back to the original hardness again. I checked the Brinell hardness at each step and those results are indicated in the photos. The piece of saw I started with was cut off a serviceable saw and I would say it was about normal for a quality saw. That is, it filed fine and had no problems with setting or swaging the teeth. It was not too hard to sharpen and still held a cutting edge well. I first checked the hardness of the original saw section. Then I tempered one area as may be done if a saw was too hard. The tempered area tested about 100 Brinell points softer then the original saw. The softer test was expected and it would follow that the softer metal would not hold a cutting edge as well as the original condition. What I do not know and have been interested in testing for is just how much of an effect the softer metal would have. Would the softer metal need sharpened twice as often? Would the saw wear out twice as fast? I don’t know, that is another test. After I tempered the blade section I intended to harden again. Depending on the type of tool steel, quenching with air, oil, brine or water can be used to harden. Not know how the saw steel would behave I first tired to quench with a blast of air from an air hose. I heated to a cherry red and cooled as quickly as possible with the air blast. It did not harden and came out considerably softer. Since my test sample was larger then a single tooth, it is possible that a smaller single tooth could be quenched and hardened with a blast of air. I don’t know, I did not try it on a single tooth. I would call this stage of the sample as normalized. It was not as soft as a full anneal but softer then the previous step. The steel would have to be heated to a cherry red and cooled very very slowly to fully anneal it. I also tested another saw that has a section that I’d guess is fully annealed and it is about 175 Brinell points softer then this stage of the test section. The next attempt at hardening was a water quench. That did the trick, it was harder then a file and it shattered during an attempted hardness test. I could cut it with a diamond hone but a file would not touch it. The last step was tempering back to a condition that would be usable as a saw. This was tempered to about a blue color and that reduced the brittleness and increased the toughness. This left the steel about exactly as hard as the original saw. It could then be filed just as it could to begin with. With this sample I made a full circle, from normal hardness (735 BHM), to tempered softer (625 BHN), to normalized softer yet (476 BHN), to very hard (too brittle to test) and back to normal again (735 BHN). So, what use could this be to saw filers? I can think of a few things. If a saw has been needlessly tempered to a soft condition or if a tooth has been replaced, the teeth could be re-hardened and tempered to a long lasting usable condition. 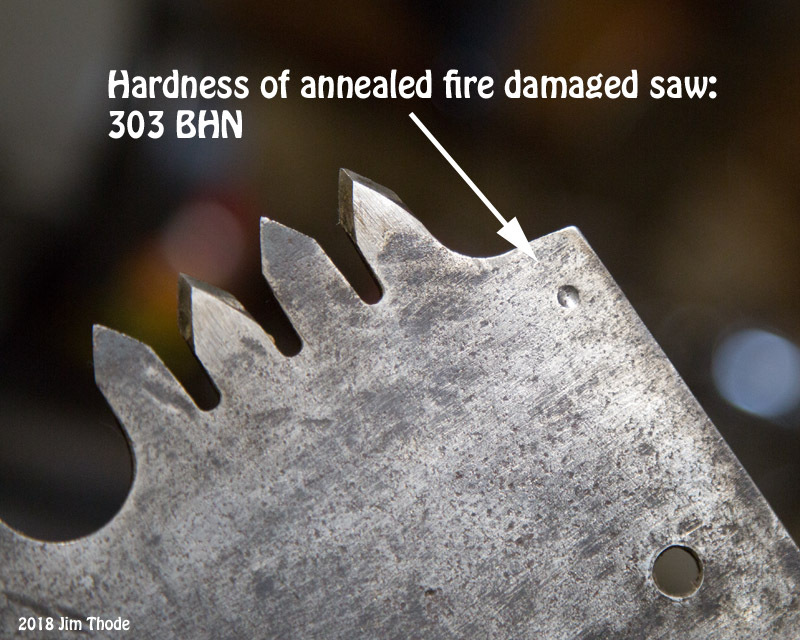 If you have a saw like my “fire damaged” saw that is annealed dead soft in some teeth (see photos), it could be re-hardened and made to perform as new. Another possibility that is done with some competition saws is to set up a saw so it is just right and then heat treat so hard that you would maintain a razor sharp edge for many times longer then even a quality vintage saw. Some competition saws are hardened so hard that they can only be touched up with a diamond hone. If they need more work they have to be tempered/softened, reworked, re-hardened and then very slightly tempered to remove some of the brittleness. Wouldn’t be nice to have a trail saw that would last five or ten seasons rather then one season? The bottom line for crosscut saw filers is that for most saws there should be no need to do any heat treating. On rare occasions a saw will be found that is too hard and they can be tempered some to help out. On even rarer conditions where saw teeth need to be hardened or completely re-heat treated, that is possible too. This was another test. 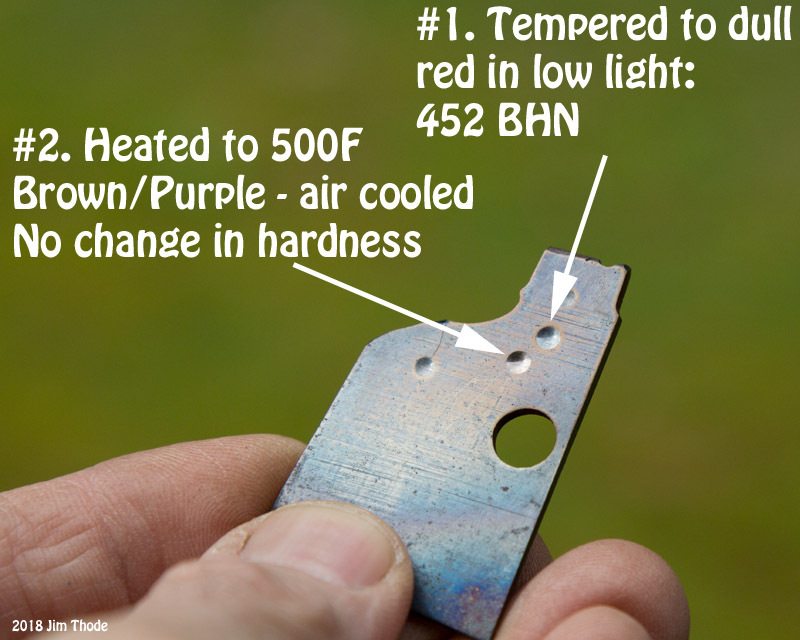 Someone suggested that a saw that was tempered too soft could be hardened by heating to 500F and letting air cool. I tried that and it had no effect on the hardness. A most excellent post Jim! You have put a lot of time and effort into your project and will be appreciated by all that can use your information. This addition to your post, adds to yours as supplemental information. I've been trying to find time in my busy schedule lately to post something similar. As with any testing, we have to be somewhat scientific about testing and making sure our results are consistent time after time and others using the same method, coming up with the same results. Using alternate methods, and coming up with the same results validates all our findings. I had time this afternoon to use a portable hardness tester, that I borrowed from a friend that works in the saw steel/tool manufacturing industry. Using it, I tested the working faces of saw anvils (Arthur's newly made anvil 57 RC) and found they all vary slightly depending on the manufacturer, and age of when forged. 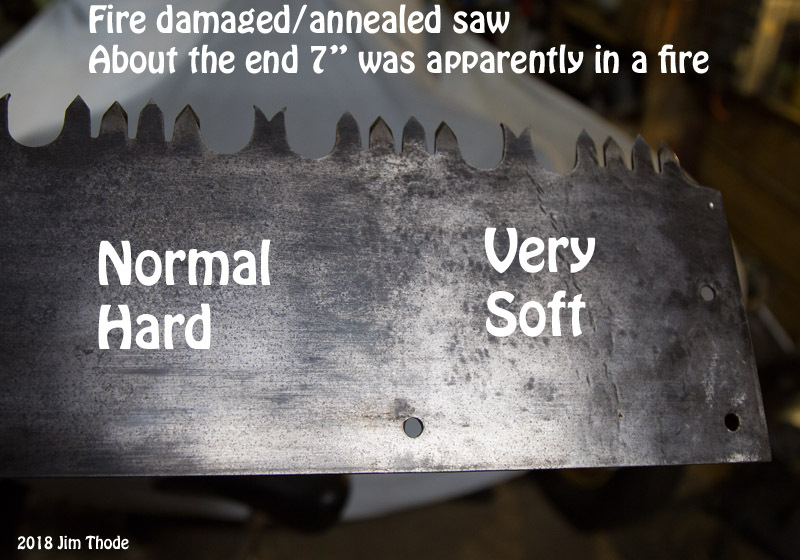 I've been interested in finding the different characteristics of hardness of saws, the different saw manufacturers made. What I found was not a big difference 54 RC to 58 RC. I did find that a lot of the saws were 2 points harder on the ends than the middle sections, but not all brands or same saw #, I tested four different #513, two were the same and two was harder on ends. 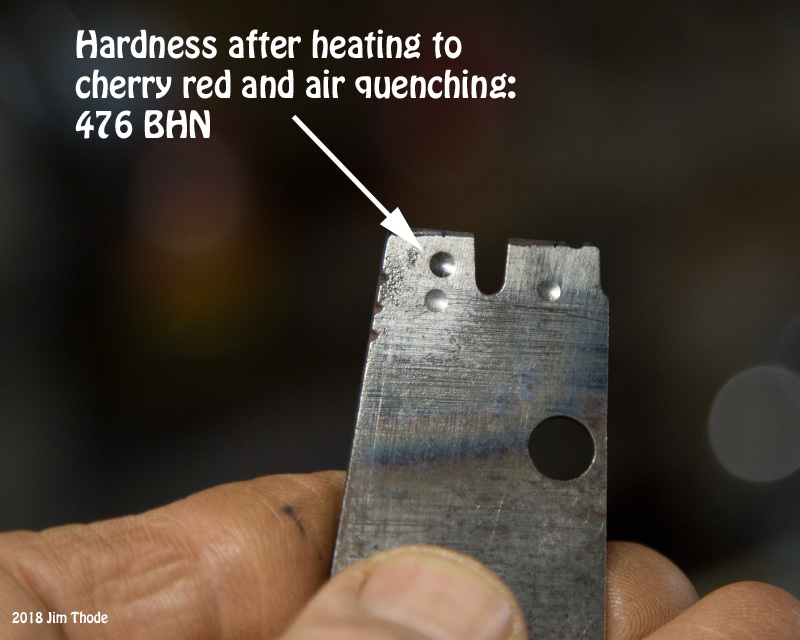 As for heat treating the saws and seeing what temperature to temper saw steel at, to soften or to harden, the results I found are consistent, to what I have seen from repairing saw steel in the sawmills for the last 40 years. If raising the temperature above 900 degrees the saw steel will get hard and brittle (martensite). Annealing (Tempering) the steel has a consistent characteristic which can be plotted on a graph, which I will show in photos below. When tempering saw steel you have to be careful you use the color charts associated with saw steel. Tool steel has somewhat different colors corresponding to the temps. I use Tempilaq temperature indicator paint, which can be bought in 50 degree increments. It melts and turns a shiny black as the temperature reaches the temp indicated on the paint. 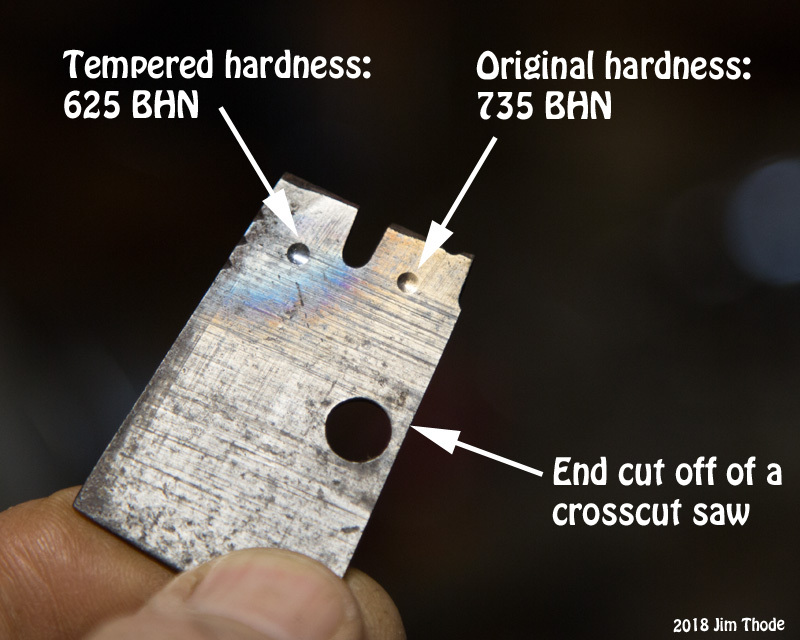 I tested two short ends of saws, to get a comparison of RC hardness. I then painted different temp paint on the saw and marked them accordingly to the temps listed on paint containers. I then heated the areas with a propane torch until the paint turned the shiny black, then allowed the areas to cool in normal shop air. After all areas cooled, I scrubbed the painted areas with a scotch pad to clean paint from areas, then tested each area, multiple times to get a consistent reading with the hardness tester. I marked the reading next to the areas tested. 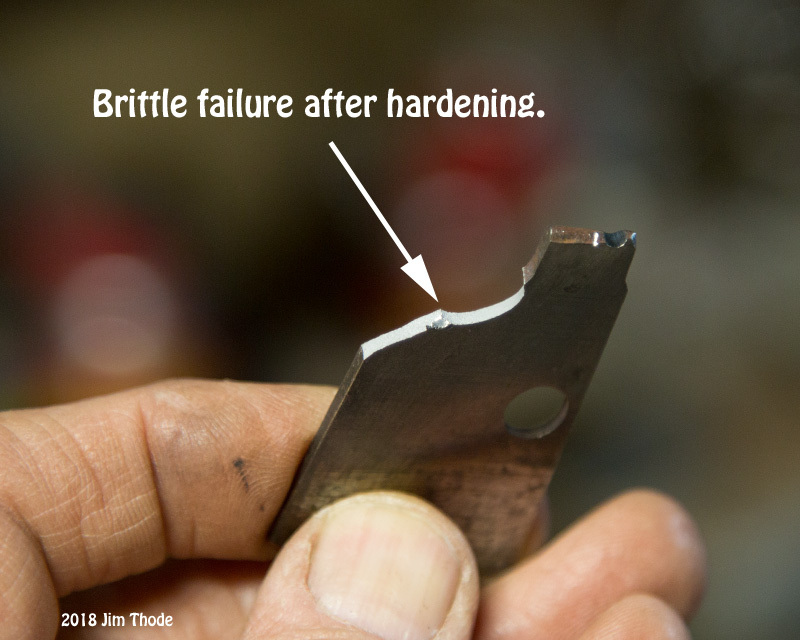 Most of the repair work I do to saws, are cracks in the body from axes, wedges, or over-bending the saw during transportation, broken cutter tips from over setting the teeth. broken Raker tips from work hardening the steel from over hammering, and broken teeth from getting the saw in a bind during use. I normally don't try to make a saw tooth harder than how the saw was originally made. The exception to this would be competition saws, made with modern band saw steel that is around 43 RC hardness. Some Band saw steel can be bought that is 49 to 54 RC. but not the normal. These I woill bring to about 100-1200 degrees, quench with a blast of air on the tooth. Left as is, it is very brittle and subject to break during use. These you need to temper, as Jim did, to soften and toughen the steel. Temperature tempered at, would be "light straw" 300-325 degrees. Hardness will be about 60 RC. Couple more photos, as I couldn't upload all first round. The BESTAR Steel information is what was sent to me when asking about saw steel used by an un-named saw manufacturing company New Zealand. 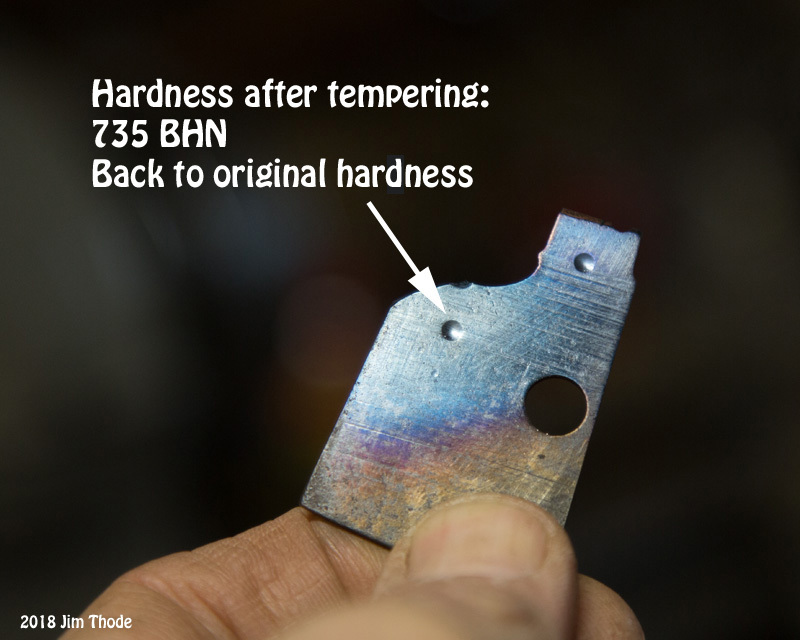 summary: when tempering saw steel the hotter you anneal or temper the saw, the softer the steel will be when cooled. The cooler you Temper the harder it will be. Exception is when you anneal over 900 degrees it will start to become hard and brittle. Trailsawyer wroteCOLON Interesting tests Jim! It likely would not be feasible to harden a whole saw but the individual teeth ends should not be a problem. On my fire damaged/annealed saw I would guess it would warp and maybe crack it I tired to harden the whole end of the saw. When I got it it was badly warped and I straightened it so there is likely internal stresses in that section. I've been using it and with a handle on the soft end I have to be careful not to bend the saw plate. I may harden just the teeth and maybe just the area around the handle holes just to see what happens. Good test! Your portable hardness tester is most likely more accurate for absolute readings then my homemade test. My reading should be good for comparing relative hardness on my tests but not for comparing your or other readings. Your temperature sensing paint is a good idea and it takes some of the guess work out of the mix. I'm thinking that any tempering over about 600F would be excessive and your test seem to show quite a bit of softening at higher temperatures. Then over 900 sounds like it would cause other problems if it starts to get brittle. With likely hundreds of different steel types I have not seen anything that would indicate that the tempering colors are different for different steels. Maybe part of that is that with modern methods the color is not so much of an indicator as it was on the past. Just use some temperature sensing compound of set the temperature on a tempering oven and you're good to go. This table kind of gives a good over view of suggested tempering temperatures/colors for different tools. Wood saws are at the top and the softest of all listed. They are into the blue color at about 550F. 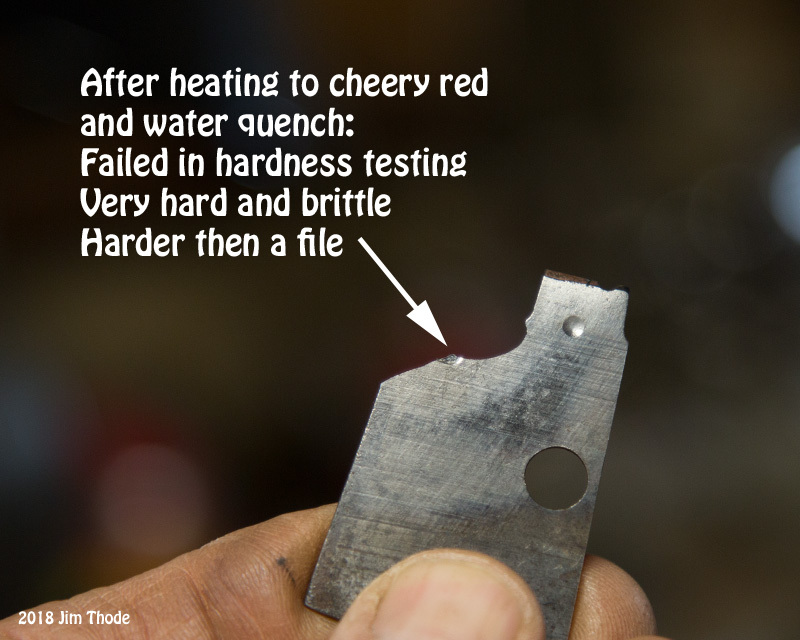 That agrees with your test where 550F ended up close to the unmolested saw hardness. I'm still thinking about some kind of test to see what all this means when it comes to actual use of a saw. How much of an effect on edge holding ability do these changes in saw hardness make when the teeth cuts wood? Starling_Saw wroteCOLON summary: when tempering saw steel the hotter you anneal or temper the saw, the softer the steel will be when cooled.